During the Engi period (901-923) under the reign of Emperor Daigo, Tomonari, a Shinto priest of Aso Shrine in Kyushu, stops at a scenic beach, Takasago-no-ura, in Harima Province (present Hyogo Prefecture) on his way to sightseeing in Kyoto with his retinue. While Tomonari is waiting for a villager, an immaculate old couple appears. Tomonari asks the couple who are sweeping up the needles under a pine tree to tell him the tale associated with the pine. The couple explains that the pine is the renowned Takasago Pine, which is paired with the Suminoe Pine growing in distant Sumiyoshi; together they are called Aioi-no-matsu (Paired Pines). 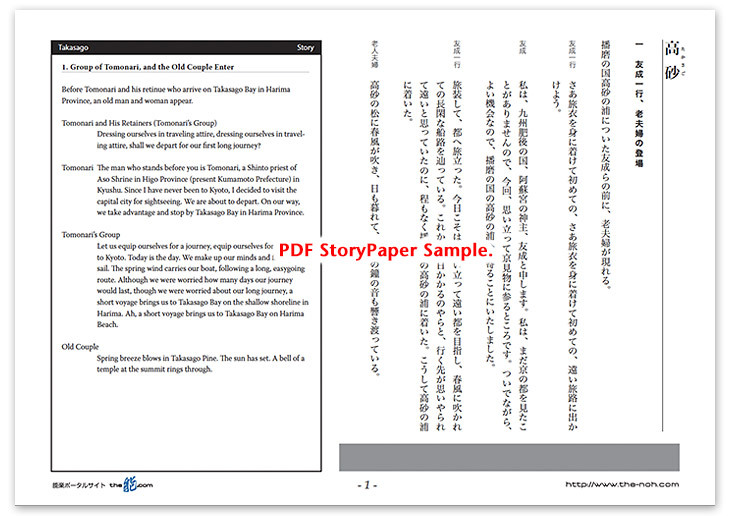 They appreciate that Japanese poetry (waka) is flourishing in the reign of the current emperor, as it flourished in the ancient age of the Manyōshu (the Anthology of Myriad Leaves), and compare the present and past with the Takasago Pine and Suminoe Pine. The old man continues that poetry flourishes because everything in this world, including trees and grasses, embraces the heart of poetry. He then explains that pine trees, evergreens which grow for one thousand years, are especially blessed and tells the historical story of the pine. Finally, the old couple reveals that they are the incarnation of Takasago Pine and Sumiyoshi Pine, which are the paired trees called Aioi-no-matsu. They promise to see Tomonari at Sumiyoshi again and board a boat from the shore washed by the evening tide. The boat follows the wind and eventually disappears beyond the horizon. Tomonari and his retinue depart Takasago Bay determined to follow the old couple and embark for Sumiyoshi when the moon rises. When they arrive at the beach in Sumiyoshi, the masculine Sumiyoshi Deity appears before the group. Under the moonlight, Sumiyoshi Deity dances airily and divinely to expel demons, celebrate the longevity of the emperor and people and the peace of this world. In this piece, the pine occupies an important role. From ancient times in Japan, people have believed that deities dwell in the pine tree and often called it “Chitose (thousand yearｓ)” in Japanese poetry because of its evergreen nature. The pine represents the celebration of longevity. It also has different sexes, which reminds people of husband and wife. 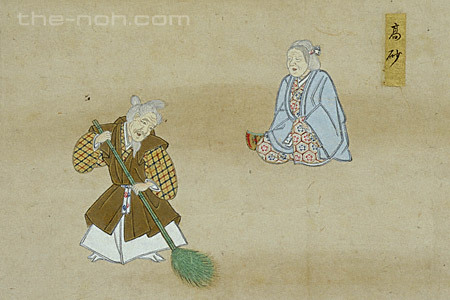 Zeami created this piece based on a phrase in Kanajo preface to the Kokinshū, “Two pines of Takasago and Suminoe seem to be a pair.” He set as the characters of this drama an aged man and woman who lived far apart in Takasago in Harima Province and Sumiyoshi in Settsu Province yet still kept their harmonious marital relationship. Zeami honored the longevity and harmonious relationship of the old couple, and compared the blessed longevity of the pine tree to the eternal flourish of the art of Japanese poetry. His efforts generated a superb piece, involving beautiful verses and crisp movements and dance. This play is one of the best of the masterpieces, persisting in the idea of blessing and celebration, extremely bright, and full of the atmosphere of nobility, dignity, and purity. The audience can enjoy this piece by simply seeing, listening, and feeling it. Those in the audience are able to experience purification through seeing Takasago.